A Microblock is a type of block which was originally added by the RedPower 2 mod, but has since been redone in the ForgeMultipart mod. 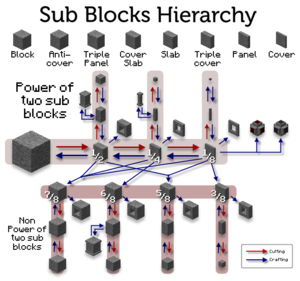 Microblocks are made by combining full blocks or Microblocks with a Handsaw or other Microblocks in a crafting grid. Besides existing in many shapes and sizes, a major feature of Microblocks is that they can be placed in the same block space as other Microblocks and certain other blocks, allowing for complex structures or sophisticated decorations inside a single block space. This can be done by simply placing a Microblock just like one would place any other block. An overlay will appear when able to place a Microblock, which indicates possible positions for it. In older versions of ftb (1.6.4), Microblocks added by forge multipart have no effective blast resistance- even two obsidian slabs stacked to create an obsidian block. 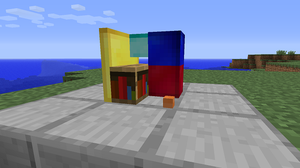 In current versions of ftb (1.7.10), microblocks maintain the blast resistance of the block they were made from. Crafting of Diamond Drawplates, Wooden Windmills and Wooden Wind Turbines.